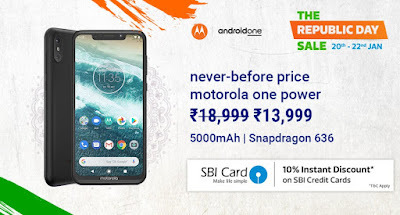 Flipkart Republic day Sale, Flipkart Republic day Offers 2018. 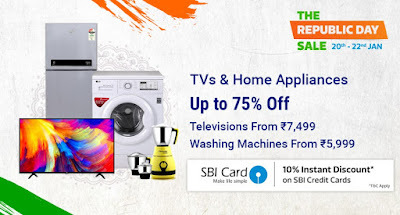 Flipkart has come up again with another Sale “Flipkart Republic day Sale” from 20th to 22nd January 2019 Where you will get discount on Millions of products and Several categories such as Electronics, Home & Kitchen, Home Furnishing, Mobile phones, Laptop, Cameras, Fashion & Lifestyle products, Clothings and several other Big Appliances. This Republic Day just buy your favorite mobiles or laptops, electronic, fashion & Lifestyle, Clothings at discounted prices between 20th Jan to 22nd Jan 2019. To avail great discount and deals on all the products just visit the official website of Flipkart and get amazing deals and offers. 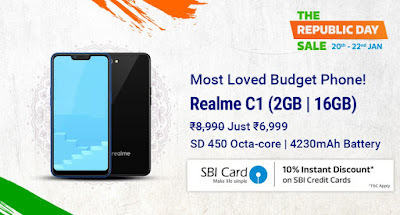 As we know that all the people want to buy best product at reasonable prices so here on this Flipkart sale you will surely get best and 100% genuine products as the main motto of Flipkart is the customer’s satisfaction. The Flipkart is the Indian online shopping site which renders discounts, extra benefits if you make payment through bank and various other facilities. So grab all these awesome offers as the offer is live till 22nd Jan 2019. + additional 10% discount for SBI Bank Credit card users. 2) Search the Product which you want to Buy. 3) Click on “Buy Now“. 4) Add the Product to your Shopping Cart. 5) Login/Sign up on Flipkart. 6) Proceed to checkout >> Enter your Shipping address where you want to deliver your product. 7) Select any Payment mode (Pay through SBI Bank credit card to Get 10% discount). 8) Order Placed Wait it will be delivered to your Home in 2-4 working days. Before Republic Day of India Flipkart host its Sale to give awesome discounted price on all Products at Flipkart.com. 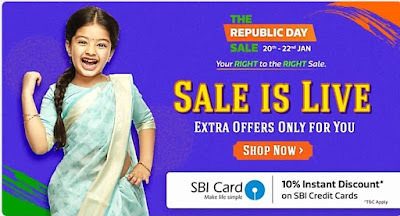 In 2019 The “Flipkart Republic Day Sale” live from 20th to 22nd January 2019. 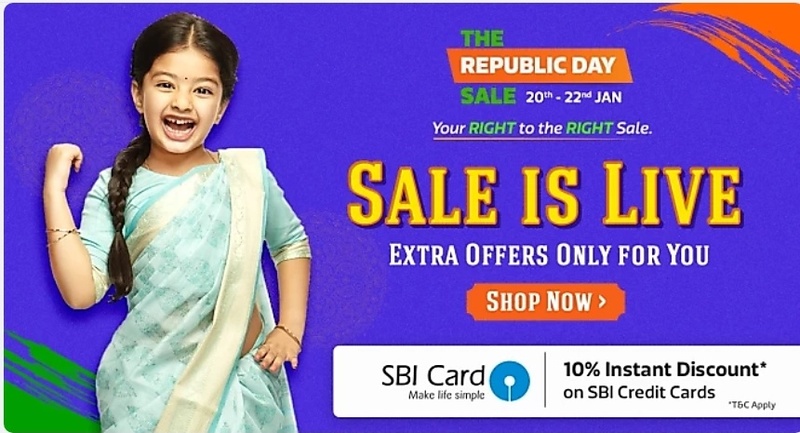 Additionally you will get the 10% Instant Discount when you pay through SBI Bank Credit cards during Flipkart Republic Day Sale. Beginning today, Flipkart has launched it’s 3-day The Republic Day Sale (20-22 January) on Flipkart Website, Mobile Site & Mobile App (Jan 20th – Jan 22nd). During this sale event, we are offering 10% Instant Discount* with SBI Credit Cards. All the consumer promotions on Flipkart during this sale period. 10% instant discount with SBI Credit Cards. Also, valid on EMI transactions. 20th January 2019 (00:00 hrs) to 22nd January 2019 (23:59 hrs). For Flipkart Plus members, sale will begin from 20:00 Hours, 19th January 2019 to 23:59 Hours, 22nd January, 2019. Net cart value, i.e. total cart value of eligible products should be equal to or more than INR 4,999. Maximum discount per card is INR 1,750 for the offer duration. How do I check if a product is an Eligible Product? Offer is applicable across all categories except Groceries. However, the offer will not apply on purchase of select products. Please check if the offer is listed on the product page, before making the purchase. For complete list of exclusions, please refer to the detailed Terms and Conditions. Is the offer applicable on all SBI Credit Cards? No, offer is NOT applicable on Corporate – cards. Yes, you can avail the offer. In this case, offer will only apply on the amount paid through SBI Credit Card against the eligible product(s). Also, this amount should be equal to or more than Rs 4,999. How many times can this offer be applied? There is no limit on number of transactions. However, you can avail upto a maximum discount of INR 1,750 per card for the offer duration. Infant milk substitutes, feeding bottles or infant foods.